Oh Thermomix I would totally use you all the time yet you are somewhat pricy. Oh Thermomix you are so versatile with your slicey and dicey. 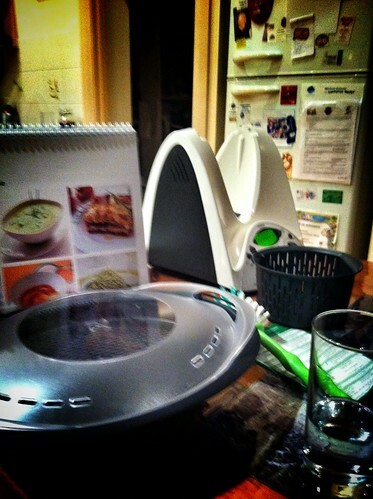 Oh Thermomix, come to me – I would give you a good home. Oh Thermomix – oh sod it I can’t continue this crappy poem. One thing this Thermomix demo made me do was drag my food processor out the cupboard, dust it off, pull out all the bits and pieces I didn’t want to use to get ready the attachment I did want to use. Still not quite the same. haha not sure I can justify the price of the thermomix for the amount of food it will cook..
I’m in the same boat as you. This is why I haven’t rushed out and bought one. Oh to dream. I figure if there is a way to brew beer in a thermomix I may just be able to convince Mr Nomad. If I could brew beer, or still bourbon I’d buy myself one in a flash. I won’t lie to you. They’re amazing. I love mine. I use it every week. The General Trader has a cheaper version, called the Thermochef and it retails for about $700? Can’t remember. It’s practically identical – seriously. I’ve heard about the knockoff version. Might be worth looking into. What’s your favourite thing to prepare in your Thermomix? You have more than one? What’s your favourite thing to prepare in yours? Where do I start Jen? The kids love tuna and pasta (yes, they cook it). We make bread/rolls/pretzels/buns regularly… and they disappear fast. Cheese sauce and steamed vegetables are great! Salted Maple Caramel ice cream (this is THE best ice cream EVER). The rice salad is just so yummy! We make mayonnaise… all the time. Love it! Gnocchi is a great hit with everyone. I made up a little flip recipe booklet for the children/other half/rest of the household’s convenience. Thanks for your reply. I like the idea of making my own bread particularly as my son’s getting older and has a huge appetite already. I also liked the idea of being able to mill seeds and so on so my pantry isn’t full of the same thing in different stages. I was impressed with how it made risotto too. Do you have a recipe for that delicious sounding icecream? Sounds gorgeous. I have no idea about a thermomix but it looks like I need to take a look and do some research. Tamara, I hadn’t really heard of them until fairly recently but if you get a chance to go to a demo, then do it. You could even host one yourself. Only trouble is you’d probably want to buy one.